Bring A Little of the Great Outdoors to Your Collection with This Around the Campfire Silver Proof! Canadians have a variety of recreational activities to choose from and many of them take places outdoors. From canoeing and hiking to camping and hunting, the Canadian wilderness provides plenty of options for those who enjoy outdoor activities. This Silver Proof comes from the Great Canadian Outdoors series. 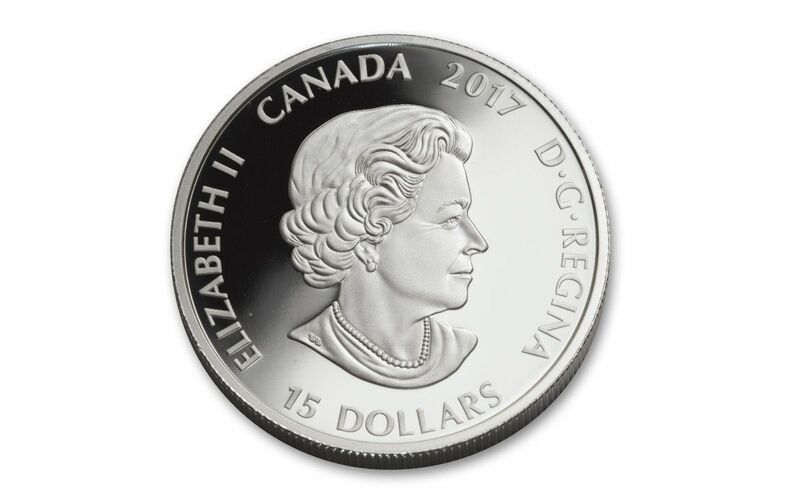 Struck by the Royal Canadian Mint, it is made of .9999 fine Silver and weighs 23.17 grams. The Proof shown here features the Around the Campfire design. While this is a Proof, the entire reverse has been colorized to show the Canadian wilderness as it appears at night. Great Canadian Outdoors Series – Each coin in this series shows something that can be enjoyed in the Canadian outdoors. This Around the Campfire design depicts the perfect way to conclude the day’s outdoor adventures. 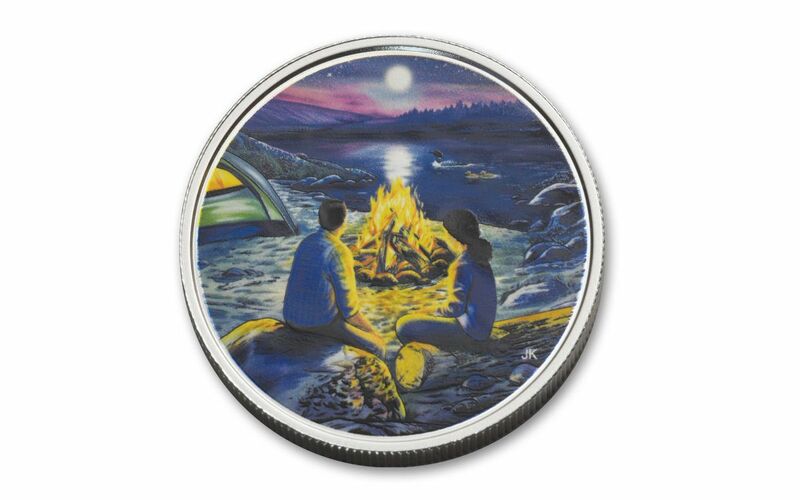 Detailed Colorized Design – This Silver coin may have a Proof finish, but the outdoor scene on the reverse has been colorized. With a range of colors, it depicts a Canadian night just as it would appear. The moon’s reflection can be seen on the surface of the water as two seated people look onward. 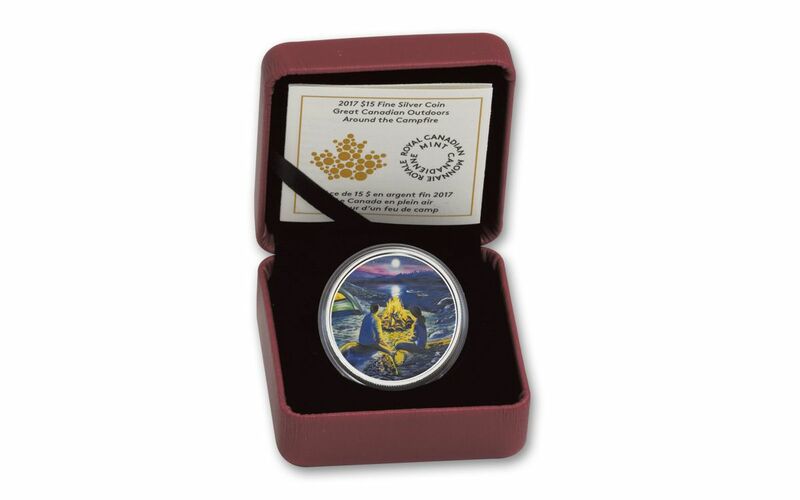 Struck by the Royal Canadian Mint – A fineness of .9999 should come as no surprise considering where this coin was minted. Production was limited as well. No more than 15,000 of these will be struck. Original Packaging with COA – The coin you receive will be an ungraded specimen. It will be inside its original Mint packaging and you will also receive a certificate of authenticity. The original packaging includes a maroon and black clamshell box. Glow in the Dark Design – In addition to being colorized, this coin glows in the dark! Just hold it in the light for a while, then turn out the lights and watch the reverse change! 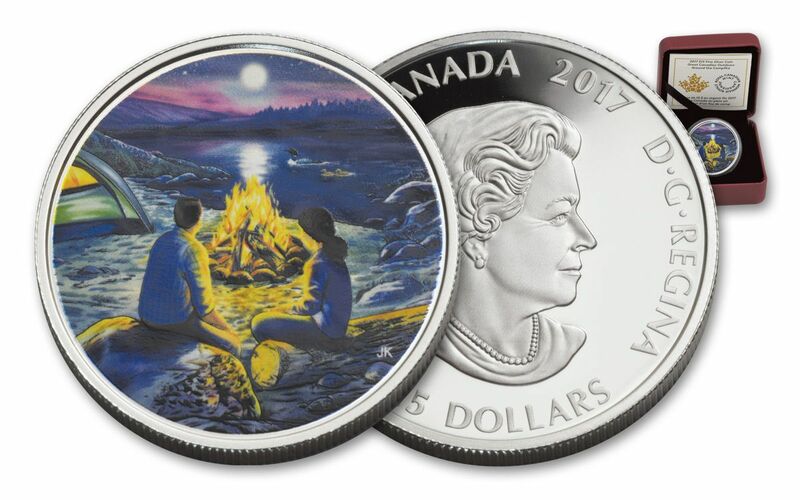 With a colorized glow in the dark design, the 2017 Canada $15 Silver Around the Campfire Proof is sure to stand out in any collection. The limited mintage alone makes this an appealing option for any collector. Order yours from GovMint.com while you have the opportunity.